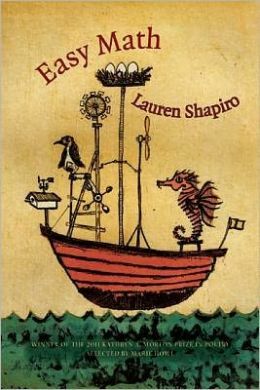 The opening line of Lauren Shapiro’s Easy Math, then, may not seem to promise very much: “There is always a woman eating a sandwich,” the speaker declares. This line may remind us of that classic criticism of Twitter, and blogs before that: “It’s just people talking about what they had for lunch.” There is some of that here, and lines that actually mention chairs and sitting in front of a television. But that is a risk when one writes a book that is self-consciously about the here and now. (“Poignant retorts to the problems of pop culture,” according to Booklist.) It can all feel a bit too here-and-now. each day, but who else is counting? they can only land on water. but I’ve lost all motor skills in my mouth. on Main Street, small to large, like graded eggs. Shapiro writes with admirable precision. She cuts out each letter like the author of a ransom note. Invariably, there is a lovely, soft sting in the tail of these cuddly “couplets.” But these witticisms fit more comfortably here, outside their poems, than they do in them, where they sit less easily. Or they sit too easily, and are more or less interchangeable parts. Most of Shapiro’s poems follow the paratactic logic of the New Sentence, and details accrete at a greater rate than connections. She professes “a love / of theory in which the proposition never / leads to the conclusion.” Many of the titles in Easy Math hint at engagement with weighty issues (“History Lesson,” “Is There a Moral to the Story?,” “It Makes Philosophical Sense,” “Humanization Squared”), but Shapiro is more concerned with writing the next good lines than with developing a plan of inquiry from her last good lines. The relationship between title and text is artificial, like an arranged marriage. Some poems are clearly throwaways (“Hotel,” “After a Long Day,” the head-scratching “The Encounter,” about a meeting between Clara Barton and Florence Nightingale): flat, fabulistic interludes that may be James Tate parodies. Still, as Shapiro reminds us in “Please Support the Wisconsin Guinea Pig Rescue League,” “Grassroots activism is all about / starting small.” This unusually straightforward poem is a mock-cry for attention for all noble causes, but though she pokes fun at activists, she celebrates the spirit of activism. But in her own way, even if her way seems trivial. (Guinea pigs rather than, say, gun control.) In other words, there are many ways to help; there are many approaches to making meaning. “I am committed to disrupting complacency,” the speaker decides near the end. It is a modest but honest goal. The best poems in Easy Math—and there are several very good ones—present meaning and language as a mise-en-abyme. “Life is mirrors pointed at other mirrors,” Shapiro says, predictably, before concluding less predictably, “and then one day / your mom comes in and breaks them all” (“Dominoes”). She does better still with a complex, recurring metaphor that involves literal folding and unfolding, the limitations and frustrations of communication and art. In one case, a “cheat sheet unfolds / into a murdered swan.” In another, there is a love note that, when unfolded, reveals “a small man in formal wear who tells me / to stop reminiscing.” In yet another, a napkin is folded into a crane, but, disappointingly, “it remains stationary.” (So close to a pun on “stationery,” as well, but it is a napkin and not paper, and that is not Shapiro’s style.) This is the neurotic’s origami. It may not be surprising to see these meta-creative gestures, but the gestures themselves are surprising, and they are the volume’s emotional core. The sadness of the worried writer. Precisions and imprecisions which a minute will reverse. is just an ending tied with a bow. I can’t remember how it goes. Strange, isn’t it, how that happens? As I said before, this is a funny book. This entry was posted in Book Reviews and tagged book reviews, Easy Math, Erik Kennedy, Lauren Shapiro, Sarabande Books, Sundog Lit, Sundog Lit Blog. Bookmark the permalink.